Eat Your City: Lazy cabbage rolls recipe - quick version of the tasty traditional Ukrainian yumminess! 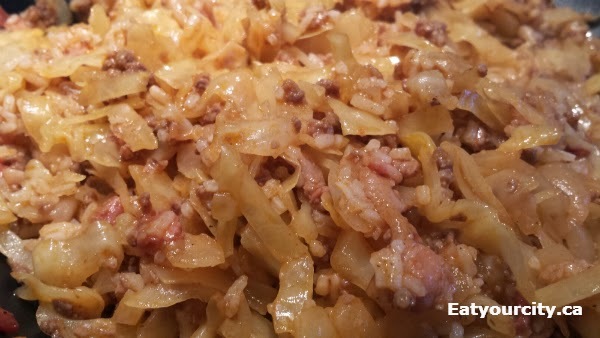 Lazy cabbage rolls recipe - quick version of the tasty traditional Ukrainian yumminess! Posted by Love cabbage rolls. 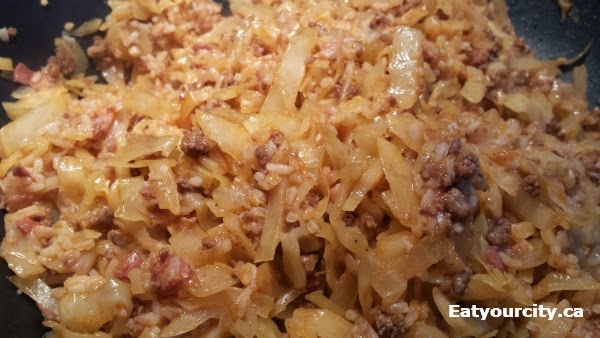 Love the comforting taste of rice, ground meat or bacon wrapped in soft tender cabbage leaves and smothered in tomato sauce. Mmmmm. But, I'm always forgetting to buy and freeze fall cabbage (apparently the rest of the year the cabbage crops grown make for less tender cabbage as most Ukrainian folks will tell you) making them. And making the full on cabbage roll take a lot of time.. and I'm lazy, so when I was introduced to lazy cabbage rolls several years back at a Ukrainian church perogy dinner, I was in love. Its a lot quicker and has all the elements of cabbage rolls, minus the smothering in tomato sauce... its not quite the same, but when you're craving them, this recipe works in a pinch! If you remember, and have the freezer space, buy fall cabbages to freeze, or toss the cabbage you're planning to use the night before into the freezer, or outside on your patio if its freezing Canadian winter cold. The thawing process helps break down the tougher fibres within the cabbage, so when you cook it, it softens up a heck of a lot faster. And don't skimp on the bacon... its only the bacon, meat and tomatoes giving primarily the heady delicious taste of cabbage rolls in this recipe. 1 lb ground meat: beef, pork, turkey, or raw Italian sausage (with casing removed). I like using 0.5 lb of ground beef and 3-4 small links of Italian sausage for more porky deliciousness. 2) Bring the 2 cups of water to a boil in a small potm add rice, turn down to low and cover for 10minutes, or prepare rice in a ricecooker. 3) In a large non-stick pan over medium high heat, add butter and crisp up the bacon, then add the sausage or ground meat and cook while giving it a good stir every now and then until the meat is all nicely browned, about 3 minutes. Add onions and garlic, cooking another 2 minutes. Then mix in the cabbage. 4) Once the cabbage is nicely mixed in, add the tomato juice, tomato soup (reconstituted if using canned) or tomato sauce. Simmer and stir occasionally for 15-20min until the cabbage is nice and soft. Add in cooked rice, season to taste and dig in!